This is it, the one you have all been waiting for, the last and ultimate prize of the Dave Turns Five Giveaway series. The prize is MONEY! Cold hard cash. Well, not quite, how about cold hard pencil-money? The prize is a shopping spree at Cult Pens to the value of £150 excl VAT sales tax but including free delivery worldwide. Hurrah for Cult Pens! Now for those of you who don’t think in British Pounds, then that’s roughly about 175 of the Unions Euros or 240 of Uncle Sams Dollars, or 19,500 Japanese Yen. There aren’t even any restrictions on the shopping spree. You could turn around and buy a bunch of fountain pens with the prize and I’ll just grit my teeth, smile nicely and wish you hours of enjoyable inking. This giveaway will remain open for 5 days, after which the winner will be chosen at random, and announced here on this post, so check back in to claim your prize. If you don’t claim your prize within a couple of days then a runner-up will be chosen to replace you. This giveaway is open to all registered readers as of August 2010. It is not open to unregistered readers. •If you are, or become, a public Follower of this blog (using Google Friend Connect, see the sidebar gadget) then you are registered. •If you have a sign in that identifies you when you leave comments on this blog, and you have previously left a comment on this blog, then you are already registered! You don't have to do anything. If you want to double check, then use the Lijit search box in the sidebar. Just search on your comment display name and check it brings you up. If it does, you are registered. (Example, search on ‘adair’ to bring up their comments) Only one trap - if your first comment ever was in the last few weeks then it may not yet have been indexed by Google/Lijit search, but give it a little time and it will be. •If you have a sign in but have never left a comment, then leave one here on this post now and you are registered. •If you do not have a sign in then you could get one by creating one here at OpenID. These ID’s are effectively anonymous. You can create them without any real world ID so you don’t have to get worried about privacy. Anyone who uses Yahoo, AOL, Blogger, Wordpress, MySpace, Live Journal to name a few already has an OpenID. Then leave a comment here on this post using your nice new OpenID and you are registered. •If you do not have a sign in and do not want to get one, then you can email me at the address in my Profile (see About Me in the sidebar) and register. In your email you can just say something like “I’ll be the Anonymous commenter who calls themselves JD-84”. •If you are one of that small number of people who have computer trouble commenting on this blog then you can also email me and register. We can work on resolving the problem you have, but if we can’t fix it, then when the giveaways are on, I will enter you into the draw myself. Remember - that was how to register back in August 2010. You cannot register now. If you didn't meet the criteria back then, sorry but it's too late now. Only 1 comment per person. Extra comments will be deleted. If you want to ask any questions, start some discussion, etc then please use the Guestbook, or email me direct. If you somehow botch your comment and need to delete it, then whilst signed in you should be able to click the trashcan beside it and then start again from scratch. If you can’t then email me and I should be able to do it for you. Having trouble commenting? Make sure your browser security settings, especially with Firefox, are set to allow third-party cookies. Still got trouble? Email me and we'll work on Plan B. For this giveaway Cult Pens are donating the free worldwide delivery and 100 of the £150, the other £50 is from my pocket, I'm sharin' the love. Live and learn. Well it was quite a long time ago now, but Memm of Bleistift made the effort to send me something he thought might be a little unusual, something new as it were. He was right, and I appreciate the effort. I’d never previously heard of Soennecken, the German brand of office products, despite Wikipedia’s assertion that “Its products are well-known in the Anglo-Saxon world”. Apparently though back in the early and mid 20th Century they were a brand of significance, supplying writing instruments of good reputation, but they went belly up in 1973. In 1983 the brand trademark rights were purchased by Branion eG and today it operates as some sort of cooperative. Frankly, I don’t quite understand its current legal status. 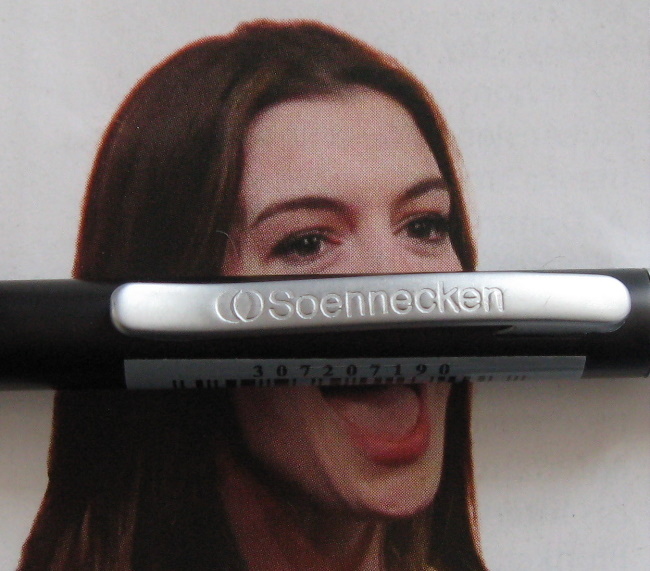 Anyway, here are some pictures of the Soennecken brand mechanical pencils that Memm sent. I doubt Soennecken actually manufacture them. The semi-metallic blue coloured pencil has a certain style. Lightly grooved grip zone. The lead sleeve is fixed. Wave-curved pocket clip with branding. The runner up, chosen by me for the best entry is...Economy Pens. I do like a bit of dark humour and Economy Pens little poem really made me sit up and take note with that little story of death drugs and rock-n-roll. Frankly, I'd like to give all of you who enetered a prize, your entries were all excellent and I enjoyed reading them all. Great stuff. Thanks very much for taking the time to enter. So, Jack and Economy Pens please email me using the address in the sidebar About Me - View My Complete Profile. The runner up is Economy Pens. Welcome to Dave Turns Five Giveaway Number Three. This time it’s Back to the Past, with “They Don’t Make ‘em Like This Anymore”, and “From The Dawn Of Time”. The above picture is of the actual giveaway items. “They Don’t Make ‘em Like This Anymore” - Conway Stewart Nippy No 3 (1.18mm) propelling pencil. Used but good condition, dating back to the days when the UK had a significant propelling pencil industry. “From The Dawn Of Time” - Ancient Kauri (0.7mm) PSI Slimline Pro Pencil 24k GT. As explained in this linked article, this pencil was commissioned by myself from a local wood turner. It is new unused, but remember, such pencils and mechanisms are not usually up to the same standards as modern retail...but hey...it's fifty thousand years old!!!!! The winner gets to choose which pencil they want. On earlier giveaways a few readers made the effort to jazz up their comments by submitting in the form of a poem, haiku, a word play or some other such little something extra. So to enter this giveaway you simply leave a comment here on this posting. BUT...not just any comment will do...your comment MUST be a little something extra...for example a poem, a haiku, a word play, a little prose on the joy you will experience at winning, one sentence on why a vintage pencil will suit you...anything will do, just make a little effort! You do not have to state your preferred prize; you can make your choice after winning. But wait there's more! The best entry, ie.e the best poem, word play, story, etc as chosen by myself, will be the runner up and receive the pencil not selected by the winner. This giveaway is open to anyone and everyone. Both pencils are from my collection so this giveaway is at my expense. Having trouble commenting? Make sure your browser security settings, esp. with Firefox, are set to allow third-party cookies. Still got trouble? Email me and we'll work on Plan B.
I’ve always been a fan of the vampire genre (‘cept never seen nor read any Twilight) and recently there’s been a big surge in popularity of vampires, zombies and other such mythical and mystical horror things. It all got me thinking about links between such mythical beings and pencils. Pretty much the first thing that popped into my mind was Wyvern. For those of you who aren’t familiar with dragons, a Wyvern is a dragon-headed winged reptilian sort of creature, and is a fairly common symbol in mediaeval heraldry. 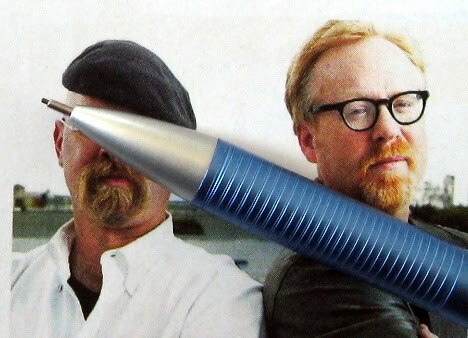 I have two Wyvern brand mechanical pencils. I have actually attempted to do something more than just a quick Google search to find out about the history of Wyvern pens, and I even found a book in the library that mentioned them, but I still don’t really know much. In a nutshell though, Wyvern dates back to the mid 1890’s in Leicester. 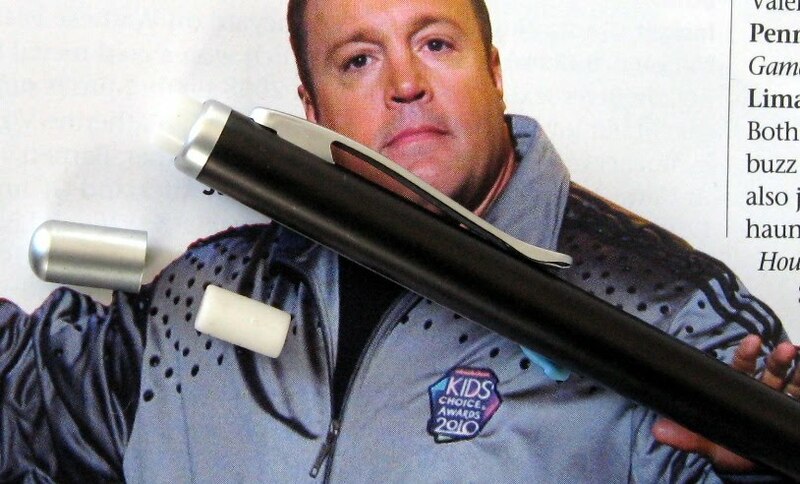 They originally manufactured eye dropper pens and also sold pens made by others. The coat of arms of the City of Leicester includes a Wyvern, hence the brand name. By the 1920’s they were also manufacturing gold nibs for other pen manufacturers and in the early 1930’s they began manufacturing mechanical pencils after recruiting a mechanical pencil expert from Germany. I don’t know what went wrong later, but manufacturing ceased in the mid 1950’s. So, I’ve got a Wyvern pen case. ‘Made in England’, it’s plastic with cream lid and black base. Kind of like a little mini art deco coffin. Inside are my two Wyvern mechanical pencils. I bought them separately, sans fountain pen. The rather large company logo of a wyvern, and the words ‘WYVERN’ and ‘MADE IN ENGLAND’ are impressed into the bodies. Additionally, the black and gold pencil has ‘707’ between ‘WYVERN’ and ‘MADE IN ENGLAND’ so I assume that is its model number which I believe dates it c1950’s. Of these mythical creatures, I personally prefer the short blue one. Unlike the 707, the blue one also has the Wyvern logo on the metal pocket clip. Both are screw mechanism tip feeders using 1.18mm lead. I quite like the look created by the dark blue striations down towards the tip. The quality of the metal pocket clip on the 707 and its method of attachment to the body seem rather questionable to me. Apparently many Wyvern fountain pens were of very high quality. From my two examples I’m not sure you could say the same about their pencils, although I’d guess that they are both from late in Wyverns history so perhaps economic circumstances had lowered the quality by then. Still, irrespective of that I’m glad to have a couple of Wyverns in the collection. Right then, I've made the draw for the winner of Giveaway 2, and it is "Viperman". So, please email me using the address in the sidebar About Me - View My Complete Profile. There will now be a short intermission in the giveaways, but don't worry, there's plenty more coming! This giveaway is now closed - Viperman was the winner. This is Dave Turns Five Giveaway No.2. 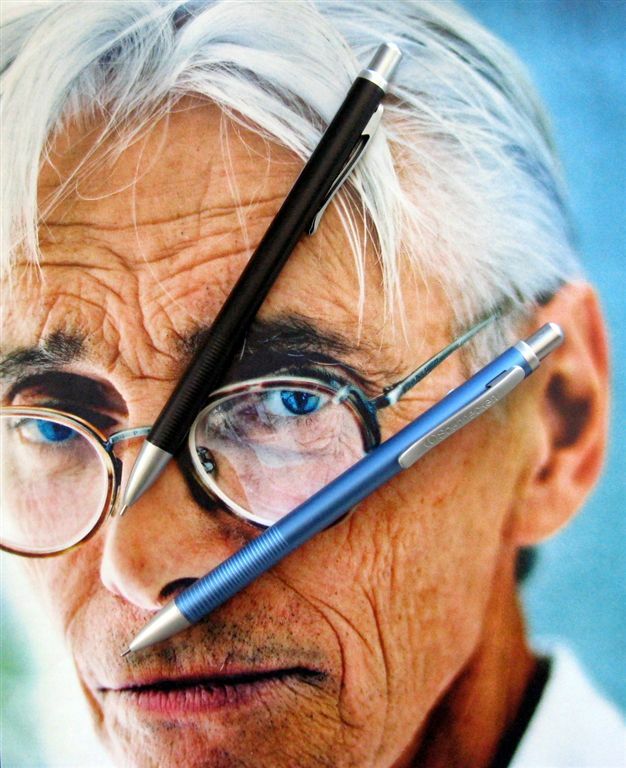 It’s a slightly strange thing to be giving away a ballpoint pen on a mechanical blog, but whilst the mechanical pencil is mightier man cannot write by pencil alone. The permanence of ink does have its place, however limited, and if you are going to sign your life away in ink you may as well do it with a bit of style. Therefor today we have a giveaway where the winner gets to make a choice. They can choose to win either the Parker Urban ballpoint pen in “lacquered magenta with chrome trims” OR they can choose the Faber-Castell E-Motion Pen-Pencil set in “maplewood with black plastic”. These pictures are of the actual giveaway items. To enter this giveaway you simply leave a comment here on this posting. Any comment will do. You do not have to state your preferred prize; you can make your choice after winning. This giveaway is open to all readers, but registered readers will have an extra chance in the draw. (Don't ask how that works, just trust me.) Both the Parker Urban and Faber-Castell E-Motion set are new unused from my collection, so this giveaway is at my expense. OK, I've made the draw and we have the winners. Congratulations to you both. Please contact me via the sidebar profile link to claim your prize. Please contact me via the sidebar profile link. Welcome to the first of the Dave Turns Five Giveaways. This giveaway is a classic ‘His & Hers’ double header, boys against the girls, but don’t worry, there are two winners! So, boys and girls, just what have we got for you? Well, for His Pocket we have a Pentel Sharp Kerry P1035 0.5mm mechanical pencil in boyish blue, and for Her Purse, an Ohto Tasche SP-10T 0.5mm mechanical pencil in feminine pink. Yeah well I like my stereotypes even if it’s not particularly PC these days. Anyway, both of these pencils are class acts and they are both capped pencils for the ultimate in pocket and purse safety. Two pencils = two winners! One Him and one Her. Just the pencils!! Him, Her and The Stig not included. ﻿To enter this giveaway you simply leave a comment here on this posting. Any comment will do, the only compulsory requirement is that part of your comment MUST declare whether you are a boy or a girl, or man / woman, male / female, whatever, I don’t care, just make it clear whether you are a Him or a Her, e.g. “Count me in. I’m a boy”. But hey, the internet is just one big melting pot and I’m not the gender police, so if your screen-name is ‘SanFrancisoStan’ and you say “I’m a girl” or ‘1.8m Hamburg-Heidi’ says “I’m a man”…well, who am I to challenge your self-identification? This giveaway will remain open for 5 days, after which the winning Him and Her will be chosen at random, and announced here on this post, so check back in to claim your prize. The winning bloke of course gets the Kerry and the winning lady gets the Tasche. If you don’t claim your prize by contacting me within a couple of days then a runner-up will be chosen to replace you. This giveaway is open to all registered readers. Kerry and Tasche are both brand new and unused, from my collection, so this giveaway is at my expense. Not sure if you are registered? Then you probably aren’t, but you can check here. Also, if you aren’t registered, but have recently become a reader then don’t despair, there will be some contests you can enter. Only 1 comment per person. Extra comments will be deleted. If you want to ask any questions, start some discussion, etc then please use the Guestbook, or email me direct. If you somehow botch your comment and need to delete it, then whilst signed in you should be able to click the trashcan beside it and then start again from scratch. If you can’t, then email me and I should be able to do it for you.